classicrider | For those who love their motorcycle and love to ride! For those who love their motorcycle and love to ride! I have done a lot of reading lately about this business of “the greeting” that we motorcyclist give each other as we are pass on the road. I have read about the variations, regional differences and supposed snobberies. And as one final bit of research I even asked a fellow biker who was filling up his big Harley Classic at the gas station, “What are your thoughts on ‘the greeting?’” His answer? He just doesn’t bother! Only if he recognizes the rider coming his way will be bother to greet him. Now I am assuming that all my readers know what I am referring to in writing about this but I will spell it out for the sake of this article. With variations, it is just the act of extending the left hand down and out at about 45 degrees as you pass another biker coming your way. One of the things I found in my reading was that there is a supposed “snobbery” of Harley riders who only greet fellow Harley riders and not pay attention to other bikers. I don’t know if that is true or not and I am not here to make a blanket indictment of all Harley riders. I’ve met some really nice ones. The attitude of my gas station acquaintance was not snobbery; he just doesn’t bother with any of it. Well maybe its just that I am new to this (only my third season) but right from the moment I pulled out onto a public road for my very first time as motorcyclist I looked forward to both receiving and giving the greeting. For me it was the reward for having gone through the effort. Buying my bike, fixing it up, studying the rider’s manual, learning to ride, going to motorcycle school, passing the tests and getting my license, it was all an effort to accomplish something I really cared about. And from the very first time another biker and I passed in greeting, that was part of my reward. With all that effort I had reached a personal goal but it was a goal that gained me entrance into a community of men and women who love to ride and love the freedom of the road. And it is an exclusive community because the vast majority of people don’t ride. Many even look at us with a wary eye or as a noisy nuisance on the road. But when I pass a fellow biker…well lets just put it this way, even my gas station Harley Classic acquaintance understood it. He said, “I suppose it’s about a sense of comradery.” Dead on!!! Definition – “A spirit of friendship and community. Good will and fellowship that exists between friends of a common interest.” And to me that is exactly what it is all about and should be about. Call me idealistic but I enjoy that greeting on the road because I believe it is an expression of comradery with my fellow bikers. All winter I looked forward to the new season and it has not disappointed! I ended up not having to buy a new battery after all and now my wife is giving me a new back tire for my birthday and the my little Honda is running like a top! Already this season I have been extending my motorcycle horizons. For the first two seasons I refused to go anywhere near the dreaded “strip.” Just over the interstate bridge at the very first exit in New Hampshire there is a major shopping district all up and down both sides of Route 12 and I have avoided it like the plague. But then one day I got a call from my wife who was at the Panera and she rather challengingly invited me to come over and join her. I took the challenge and put aside my cowardly ways. It was a beautiful sunny day as I got onto Interstate 89 and headed to New Hampshire and my fist time out of the state. This time I mirror checked and head checked as I merged onto the highway from the ramp. My little CM400 easily opened up to highway speed but I stubbornly set my on pace at 55 (not the speed limit of 65) just to enjoy the ride more. As I got off and merged onto the dreaded strip I couldn’t believe my luck! Green lights all the way to the restaurant! I hit the directional and pulled into the parking lot and even got the space right next to my wife’s car! It was all so easy! For those of you who do city it sounds silly I know but for an old Vermont boy used to country roads it was a sigh of relief. Even the minimal bumper-to-bumper traffic getting back to the on-ramp was not a big deal. I just left it in 2nd and feathered. The whole experience of doing something that I had avoided gave me a new spirit of wanting to extend my motorcycle horizons. The other day after getting my check in the mail (I always ride to the Post Office on my motorcycle) I decided to just ride down to White River and make the deposit on my bike. A year ago I never would have done that! I would have ridden back to the house and taken the car down. Instead I enjoyed every moment of the beautiful ride down Rt. 4, made the deposit and rode back on the interstate. 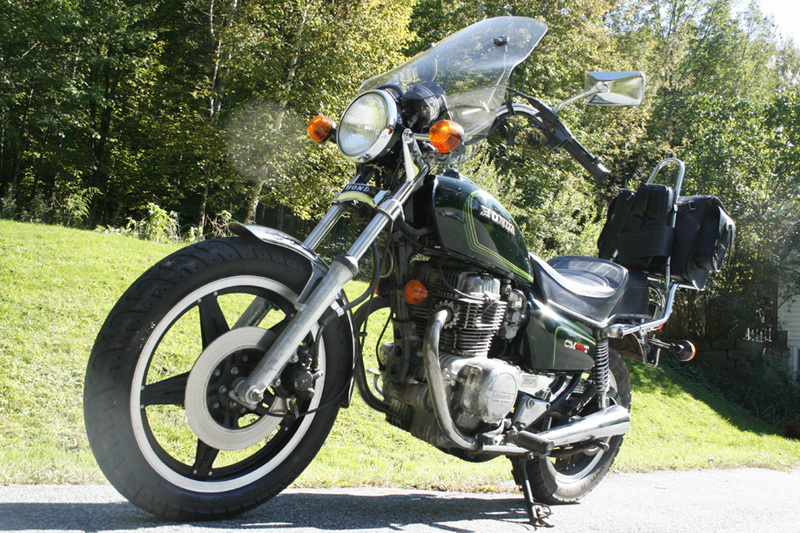 I am now starting to sense the freedom that so many bikers do and I have a new found confidence in my old 1980 Honda cm400t. She seems up for anything I want to do. Well my second season is more than half over and my motorcycle travels have been very limited. I have done a few trips around town and ridden some of the beautiful winding back roads of Vermont but one thing I had not done until recently was to go out on the highway and take my old classic Honda up to speed. At the beginning of the summer my friend BJ and I were talking motorcycles after Bible class one evening. He has a BMW 1200 that he rides back and forth to work each day and he is not the least bit afraid of taking off on an extended trip. He has already put on 5000 miles this summer! I did only 500 all last summer! But while we were having that conversation I mentioned that I had never been up on the highway and that I had a plan to just ride one exit north to the town of Sharon. It is only 9 miles but it would give me the feel of what it is like to “get out on the highway” (a little Steppenwolf there) and experience speeds of more than 45 mph which is about all I do locally. BJ suggested that we get together and do the ride some time. Well we finally got to it! Last Wednesday evening we set the time to go right after the church pot luck the following Sunday. Sunday morning dawned dark and ominous and soon it was pouring down rain. I thought, “Well I guess the ride is off!” I have to admit I was almost relieved! A touch of coward was getting to me about taking my old CM400T (and me!) up to speed. But… just before church began the clouds broke the sun came out and it turned into a glorious day! BJ brought his BMW to church as usual so there would be no backing down. I had to do this! As soon as dinner was over I ran up to the house and got out of my suit and into jeans and a t-shirt. It was a moderately warm day but I figured even with my leather jacket at 60 mph I would be fairly comfortable. I got my old girl started and after the usual hassle of getting her into second gear BJ and I were off. As soon as we hit the interstate it was an adrenalin rush! In no time I had the old girl in fifth and got up to 55 mph. She is a 32 year old bike in need of some tuning up but she seemed to handle 55 all right. I let her settle in for a minute before rolling on the throttle and going to 60. All nine miles up the highway the ride felt exciting and a completely new experience. No side roads, hidden driveways, or potholes just the exhilaration of ‘flying!’ BUT I quickly found out that a car going by me at 70 was enough wind turbulence to create some instability on an old street bike. Meanwhile BJ stayed behind me on his BMW and I was grateful knowing he was back there. We got off the exit and pulled into the gas station to ‘take a break’ and get the critique. BJ let me know 3 things. #1 I was almost clipped pulling onto the interstate. I got to the top of the ramp and all I saw was the wide open highway ahead and I never checked. There was a car right beside me as I pulled out! #2 I slowed down before hitting the off ramp. He told me that cars coming up from behind at highway speed can do a number on a motorcyclist. IE take the ramp at speed then decelerate to the end of the ramp. #3 The speedometer on my old Honda is off by 5 mph. 55 = 60, 60 = 65! Those were lessons and information well learned for future reference. I was embarrassed about pulling onto the highway without checking my mirror and doing a head check. I know better than that but in my excitement I blew it and I could have been sideswiped. It won’t happen again! On the way back down the highway to Quechee I remembered to put my highway pegs out and just relaxed and enjoyed the ride. It was a beautiful day with a blue sky overhead, my beautiful Green Mountains all around and my old motorcycle under me. It was indeed the perfect day to climb into the saddle and head out on the highway! A ride to remember! We all climb into the saddle for different reasons, to get to work, take a run to the post office, join up with some fellow bikers or just to grab and evening ride. But no matter what the reason I think we can all agree that getting back getting back home alive is an overriding priority from the moment we shift down into first and pull out to the yard to turning off the key at the end of the ride. A few weeks ago a friend of mine that I have ridden with many times was on his way home. It was late and thankfully it had been an unusually chilly day here in Vermont and New Hampshire. The result was that he was wearing layers of cloths, heavy gloves and a helmet. He was doing about 75 mph on the interstate when he hit a bad “pothole” in the pavement at the beginning of a bridge. He tried to slow down before hitting it. (In motorcycle school they taught us to accelerate just before hitting it to give the front wheel some buoyancy going over it but I am not so sure that it a good idea at 75!) The resulting jar to the bike sent it into a death wobble that was uncontrollable. My friend tried to muscle control back into the bike but in the end he was high-sided as the bike went down, slid on its side and came to rest against the side of the bridge with the head light pointing back into the oncoming traffic. While the bike was headed one way my friend was headed the other and sent into a roll that just shredded his cloths and one shoe went flying off. No one stopped to help him. When I rode into the post office parking lot the day after this happened, his wife came rushing up to me to tell me all about it. As she told me the story all I could picture was my friend all laid out for his funeral. Miraculously he was able to get up, find his shoe, pick up his bike and ride home at just 50 mph. As she was describing all this he walked up and showed me his injuries. He lost the skin on both ankles, had a badly bruised elbow and was sore for a few days but that’s a small price to pay for going too fast on an old bike. (1985 Kawasaki 550) I went over to where he had parked his bike and all I can say is. Wow! 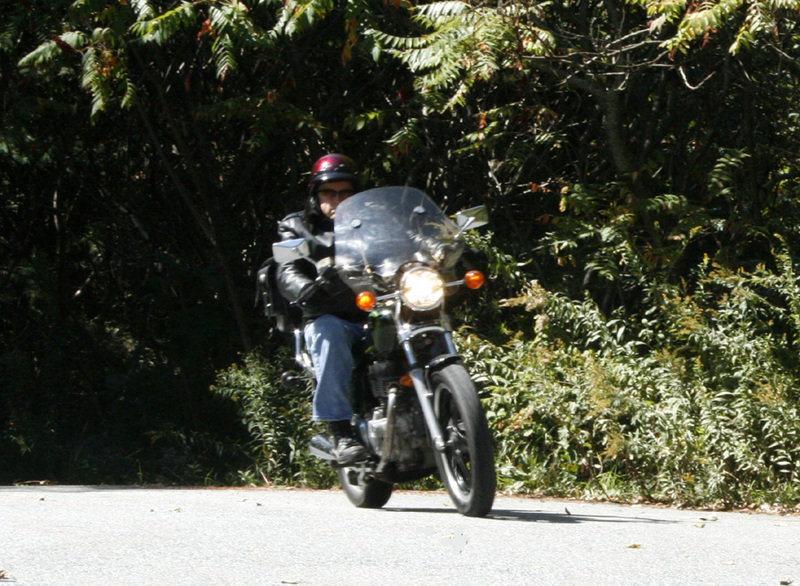 The right handlebar is bent forward and the right tail light is ground off so there is only ½ a taillight left. Right now, he doesn’t plan to ride for a while and who can blame him after that experience. He has a sweet wife and two small children and that’s enough bring things into perspective. I am sure you will find that there is not a motorcyclist anywhere that doesn’t value his time riding. We all do! With the coming of spring and warm sunny days, every ride is a pure delight. Whether it’s the speed, the riding skill, the beauty of the scenery whatever it is. Any of these or a combination of all of them goes to make time in the saddle a joy that only a rider can understand. And of course none of those joys would be possible were it not for that trusty steed under you. Most of us develop a genuine love affair with our bike. Though I may go on to someday buy another motorcycle, I will always hold a great fondness for my old classic Honda. I only paid $350 for it. But when I am walking back from the Post Office to my bike at the edge of the parking lot (where no one will hit it) I look at my pretty little cm400t with as much pride as if it were a $40,000 Harley. The saying goes that a boat is just a hole in the water into which you pour money. While I don’t think motorcycle riding is quite that bad it definitely can drain away a few bucks. There is no question that owning and riding a motorcycle can end up costing you a lot of money. New bikes today go for anywhere from $9000 for a new Honda Shadow to $40,000 (as I already mentioned) for a new Harley. Motorcycle school, helmet, boots, gear, accessories for the bike, the list goes on and most of us who ride are perfectly willing to part with our cash on anything that the wallet will afford that adds to our beloved ride. In monetary terms, I probably only have about $500 into my motorcycle. Just adding parts that improve performance or restore the original look of the bike those are things that I am glad to spend the money on. And there is a definite pride factor in the willingness. 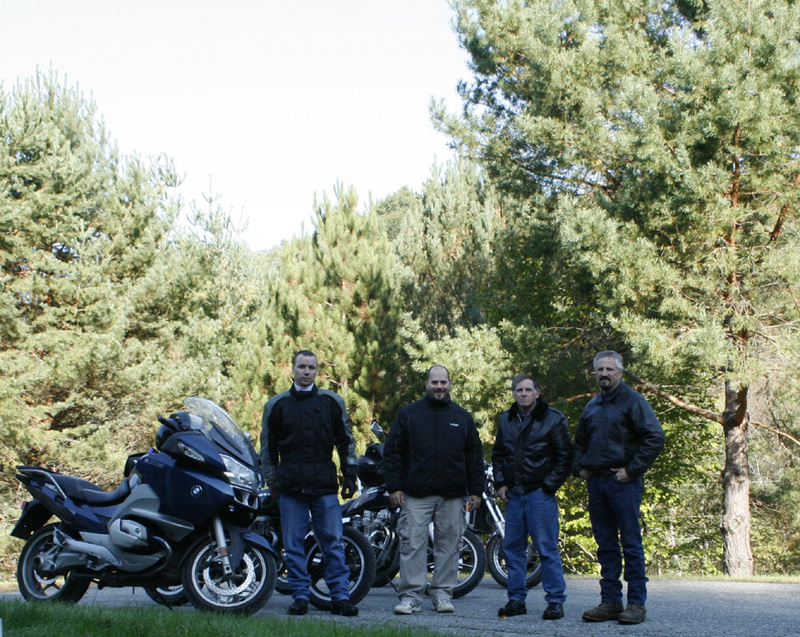 I remember the morning last fall that me and three of my riding friends met at the church building and rode down to the Crossroads Diner for breakfast. When we got back we lined up the bikes almost by accident (photo below) and got off to stand around and just talk for a while. As we were having our discussion I couldn’t keep my eyes off how great my Honda looked along side the other bikes. I had shined her up and got her looking fine for the ride. She wouldn’t hold a candle to BJ’s BMW but she’s my baby. When I first started riding and I learned how much my friend paid for his bike I almost choked. I thought, “How ridiculous to pay that kind of money when you can get a perfectly good ride in an old classic for a fraction of the dollars spent!” But after riding for a year I have changed my whole way of thinking. If my friend Ambrose or Dave (both of whom own big Honda Shadows) want to spend their hard earned dollars for a really nice ride that is their prerogative. Both of them are big men and need a ride to suit their stature. I, on the other hand am only 5’7” and 150 lbs and my Honda works well for my size. In the end the value we all put on our bikes can not be judged in the money we spent for it. For what it’s worth, it’s all about the pure joy we all feel just flying down the road and getting to hang out with others that share that joy and enthusiasm. I knew Herb Fellows for many years. I admired him as a man of principle and wisdom. He raised two fine daughters and accomplished some wonderful things in his lifetime. But it was not until I started riding last year that I remembered the stories I had heard long ago about the young man who married a pretty young lady named Jane Cote’ back in 1949. I had the very good fortune to marry their daughter about 22 years later. Herb would go on to be a policeman on the Hartford, Vermont PD and then become the first policeman/police chief in Norwich Vermont. But in his younger days, before becoming a family man, Herb was the proud motorcycle rider. This is his story. It was just another school day as Herb headed home from Springfield High on his red motor scooter. It was about 5 miles out to Route 5 and another mile up to the farm where he lived at the time. As he was about to make the turn he noticed Bobby Lafontaine pulled over and working on a motorcycle. He was frustrated because it just wouldn’t run. Bobby came from a wealthy family in town and for the moment all that mattered to him was that his ride wasn’t running and Herb’s ride was so he suggested an even swap. Herb gladly took his offer and Bobby LaFountain rode away on the red motor scooter while Herb began the long push home of his newly acquired motorcycle. Even one mile of pushing up Route 5 was work but it was worth the every bit of the effort. He rolled the bike into the barn and got to work on it. Before the end of the week Herb was out riding his very own 1938, red, Indian Scout with the suicide shift and Indian head emblazoned on each side of the tank. He very quickly fell into riding with the Hall brothers whose father owned the only motorcycle shop in Springfield. They specialized in Harley’s but no matter whether HD or Indian there was then, as there is today, a certain comradery among those who ride motorcycle. The Hall brothers had built jumps in the local gravel pit and Herb joined them on his Indian. There is no doubt that pit jumping had to be rugged on a bike but the Scout had a reputation for indestructibility. It was the mainstay of Indian all through the 20’s and 30’s. 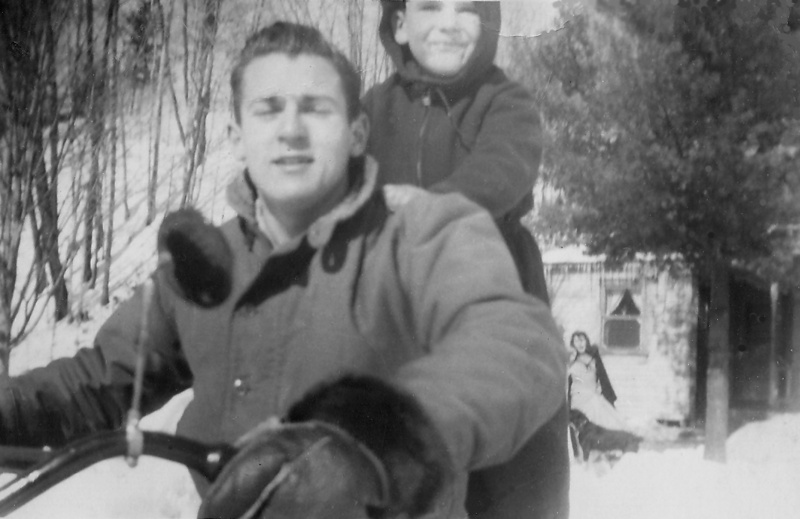 It held the proud slogan, “You can’t wear out an Indian Scout, it will wear you out first.” When Herb got his scout it was only 8 years old and it became his only mode of transportation summer and…winter! That’s something almost unheard of in these times! I live and ride in Vermont just as Herb did and the standard now is that the bike gets put up for the season by the end of October, and maybe on into November if you are a die hard, but once snow hits he season is over and nobody rides! I guess they were made of sterner stuff in the 1940’s. As I already mentioned Herb began riding while he was dating an attractive girl named Jane Cote’. She even had the honor of riding with him a few times. Unfortunately her father, a former French Canadian lumber jack saw her come riding home and made just one statement. “Girls don’t ride motorcycles!” Sadly, that eventually ended Herb’s riding days. For a while he would ride up to her house, walked with her down to the movie theatre then hire a cab for them to get back to her house where he got back on his motorcycle and rode home. In the end, he sold his Indian and bought a 1932 Chevy Coupe with a rumble seat. I am sure he is not the first young man to sacrifice his ride for love and I admire him for doing it. My only regret is that he died before I heard the story and started riding myself. I would truly love to have shared that part of his life and listened to his stories and experiences first hand. This article is dedicated to his memory. I will remember you, Herb when I am out riding the back roads of Vermont just as you did. I only wish you could be with me on your ’38 Scout. I would be honored to ride with you. Rest in Peace. 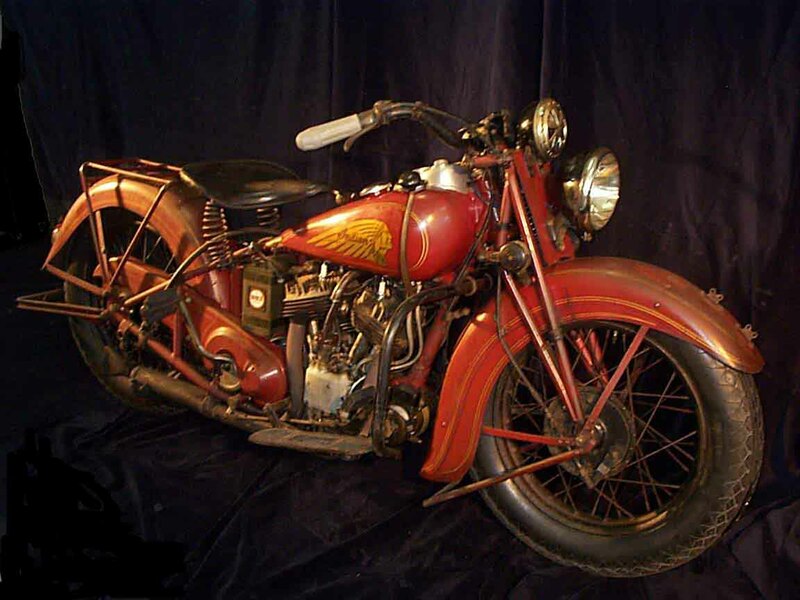 The ’38 that Herb rode had a 30.07 cubic inches (490 cc) engine with 35bhp and only weighed 358 lbs. By comparison my 1980 Honda has a 395 cc engine with 43 hp engine and weighs 405 lbs. 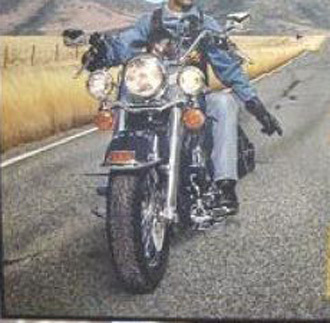 The Scout was both rugged and fast for its day and consistently outperformed the comparable Harley. The ’38 scout below has to be similar to Herb’s. But all the planning got me thinking ahead. Every time I drive locally I can’t help but see the road conditions that have developed during the winter. Cracks, pot holes, deteriorating pavement and snow plow damage are changes in the road surface that will effect how I ride next spring. The result has been a consciousness I call “road check.” This is more than just casual observation, it is getting to really know the road I will be traveling as a motorcyclist. 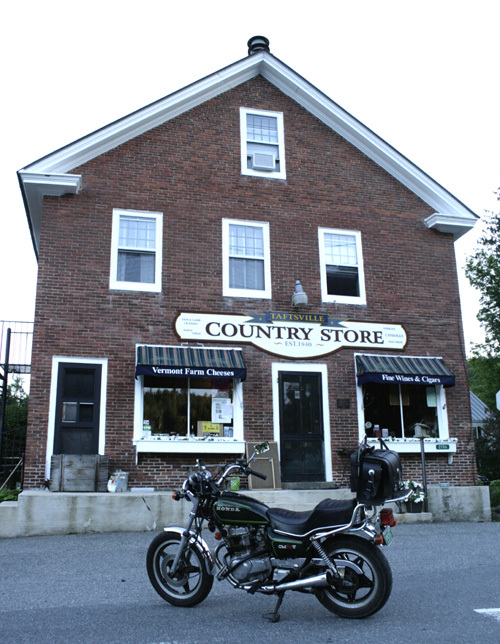 Next spring I want to make a ride over to Woodstock to pick up my hunting and fishing license. It is only about 8 miles but before then I will be making a few trips over to be in an art show. Even though it only a short distance I plan to be road checking and make some mental notes. And it’s not just about road surfaces but any areas of travel that would present dangerous conditions. I realize that what I am about to say will probably get some groans and derogatory remarks from the more experienced “just jump on the bike and ride” crowd but as a relatively new rider I am still bit of a safety nut. There are times when Route 4 is loaded with traffic (I can look down through the woods and see it) and I will actually postpone my ride until the traffic dies down some. My idea of road check is part of my over all desire to limit risk. Obviously I will not be driving my Jeep all the way to the Canadian border and back just to do road check. But on local roads that present potential dangers from intersections, surface conditions or sharp bends (a normal thing in Vermont) it’s worth the effort to do road check before I swing my leg over the saddle.